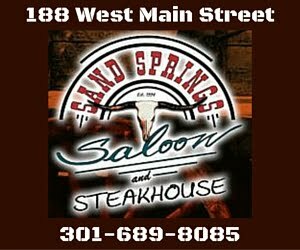 If you are looking to plan a night out in Frostburg and need a variety of craft beer and speciality cocktails, unique food, and energy-filled music, but still want that small town vibe – Look no further than Dante’s. The bar, named for a previous owner’s river dog, takes up four storefronts at 16 West Main Street, dominating the block with space to host community events, full concerts, and regular art openings. The expansive offerings of the venue, as well as the atmosphere that blends Appalachian culture with boundary-pushing vibrant art, contribute to the universal appeal. Around the corner towards the end of the bar is the main stage. A large room, it is filled with tables and chairs easily arranged to open for a dance floor and a massive stage fit for solo acts and full bands. 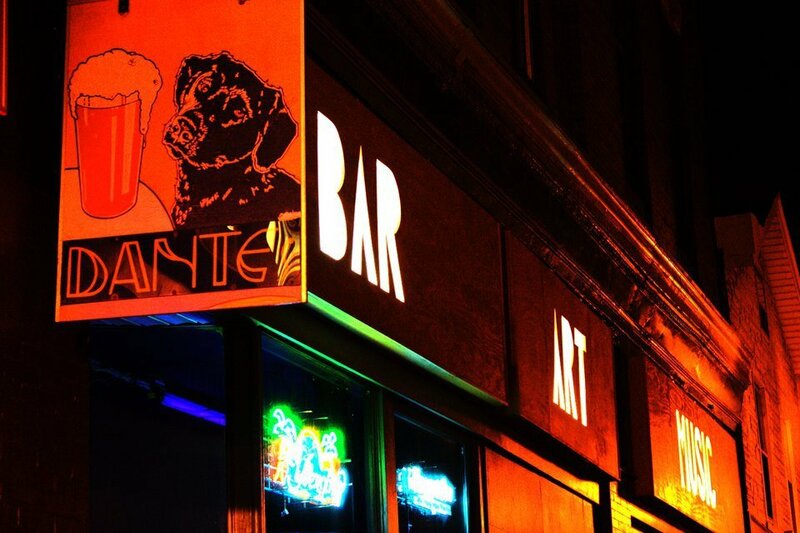 Dante’s hosts local artists, up and comers, and nationally known musicians. Coming up on February 1st Dante’s will be hosting Cris Jacobs, who has just released a new album with Aaron Neville and has frequently appeared at DelFest. The main stage room also plays host to the bar’s monthly art openings and showcases an ever-changing spread of local artists’ work ranging from painted records to metalwork to tattoo art and more. 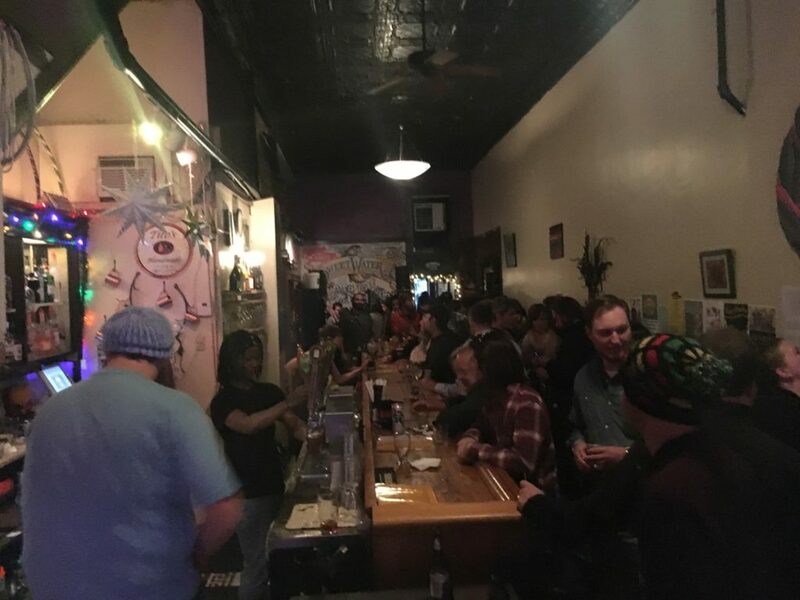 Regular events include a free jazz dinner the 1st Friday of every month, trivia every Thursday, open mic nights the 2nd and 4th Thursdays, mARTini paint nights the 3rd Monday, and art openings the 1st Saturday of every month. Those customers wanting a quieter, more intimate environment can head out the back door to Dante’s back patio. Stocked with outdoor furniture and lighting, it’s the perfect atmosphere to chat with friends and catch just a little of the music from inside while gazing at the stars. “Being someone who is into music and art, it’s nice to have a space to incorporate all of those things,” explains Erin. Dante’s has the versatility to provide an ideal and welcoming experience for any local or traveler looking for a night out and a taste of Frostburg. The building, built in the 1900s has been the home of many bars at the heart of Downtown Frostburg and it’s evident the vibrancy and experiences of all those revelers and artists have left their impact on this true hometown staple. Don’t miss the 10th annual Chili Cook-Off and Cornbread Throwdown on January 27th! 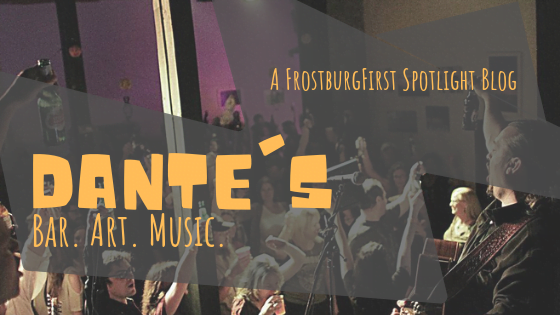 For a full schedule of the latest bands to hit the stage at Dante’s, visit their website at www.dantesbarfrostburg.com or like them on Facebook at @DantesBarFrostburg.